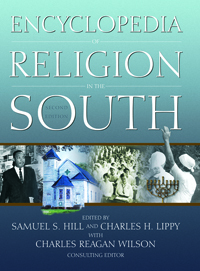 This is an indispensable resource for anyone interested in the South, religion, or cultural history. The publication of the Encyclopedia of Religion in the South in 1984 signaled the rise in the scholarly interest in the study of religion in the South. Religion has always been part of the cultural heritage of that region, but scholarly investigation had been sporadic. Since the original publication of the ERS, however, the South has changed significantly in that Christianity is no longer the primary religion observed. Other religions like Judaism, Buddhism, and Hinduism have begun to have very important voices in Southern life. This one-volume reference, the only one of its kind, takes this expansion into consideration by updating older relevant articles and by adding new ones. After more than twenty years, the only reference book in the field of religion in the South has been totally revised and updated. Each article has been updated and the bibliography has been expanded. The ERS has also been expanded to include more than sixty new articles on religion in the South. New articles have been added on such topics as Elvis Presley, Appalachian music, Buddhism, Bill Clinton, Jerry Falwell, Fannie Lou Hamer, Zora Neale Hurston, Stonewall Jackson, popular religion, Pat Robertson, the PTL, sports and religion in the South, theme parks, and much more.